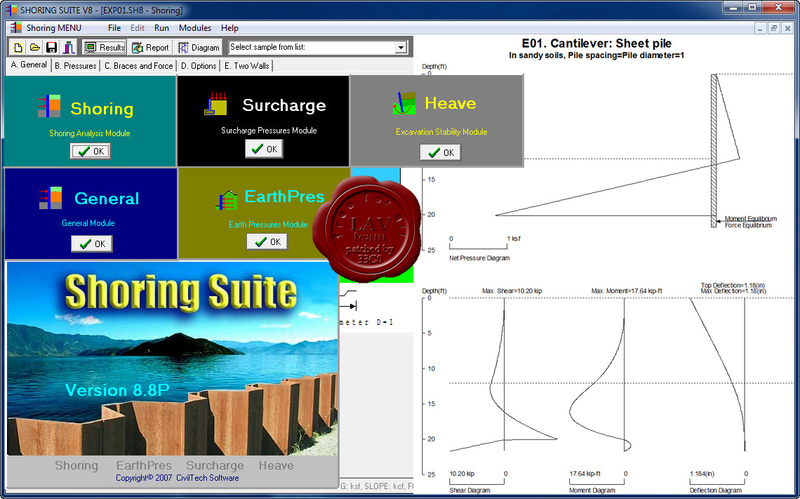 Shoring Suite is a software package that contains 4 Modules: Shoring, EarthPres, Surcharge and Heave. These modules are sophisticated design and analysis tools developed by experienced engineers and professors. The program has been widely used by engineers, contractors, universities, and government agencies nationwide and overseas. The program is flexible, powerful, and has high performance qualities. The calculation is based on Federal Highway Administration (FHWA) methods, US Navy DM-7 (NAVFAC) manual, the Steel Sheet Design manual (USS) and TRENCHING AND SHORING MANUAL of, California Department of Transportation. It can be used for complex ground conditions, surcharge loads, and many types of shoring walls including: braced cuts, cantilever walls, bulkhead walls, sheet pile walls, soldier piles & lagging systems, tangent pile walls, slurry walls, and any flexible walls. The program can link to EarthPres and Surcharge modules so that the data from these two programs can be directly imported into Shoring. The program shows diagrams of pressures, shear, moment, and deflection. It calculates the moment of the piles and selects the five most suitable piles for you. The program not only presents the major properties of these piles but also calculates the top deflection of each pile. For braced systems, the program supports calculation for wale and strut. For tieback systems, the program can determine the free length, bound length, and non-load zone of tieback anchors. <Smart Input> places soil properties at your fingertips. It is great tool for shoring design engineers.